With recipe-driven blogs, cookbooks, reviews, and endless foodie websites, food writing is ever in demand. In this award-winning guide, noted journalist and writing instructor Dianne Jacob offers tips and strategies for getting published and other ways to turn your passion into cash, whether it's in print or online. 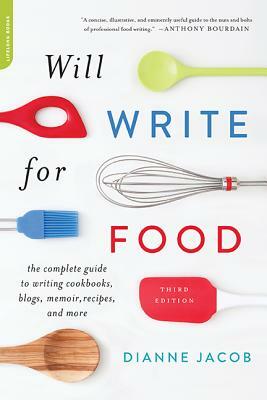 With insider secrets and helpful advice from award-winning writers, agents, and editors, Will Write for Food is still the essential guide to go from starving artist to well-fed writer. Dianne Jacob is a popular speaker as food writing conferences and workshops in America and around the world. She judges for both the James Beard Foundation annual cookbook awards and the IACP annual cookbook awards. The coauthor of Grilled Pizzas and Piadinas and The United States of Pizza, and the writer of The Good Pantry, she lives in Oakland, California.